I’ve been baking more often recently to provide encouragement and show my appreciation for those students, staff, and faculty working with me on the University of Maryland Public Health Garden. Last week, I tried these PB&J muffins. They are easy and a little different. Paula Deen always has good ideas. It is messy to make though! PB&J Muffins (from Paula Deen)? In a food processor, combine the flour, sugar, baking powder, and salt. Pulse in all of the peanut butter until the mixture resembles coarse crumbs. Add the milk, egg, and butter and pulse until combined. Distribute half of the batter equally among the muffin cups. Drop a teaspoon of jam into each cup and a teaspoon of peanut butter and cover with the remaining batter. Top with the chopped peanuts. Bake until the muffins are light golden, 15 to 20 minutes. Transfer them to a wire rack to cool. Serve warm or allow to cool completely. Spread compound butter on top. Note: Store in an airtight container. The muffins will keep for 1 to 2 days. Share with friends. I was up in NJ last weekend helping my grandma move from her home in Queens, NY to a new apartment in an independent living facility in NJ. It was a great success. We also had time to get together as a family to have Sunday brunch. We made a family classic: crepes. Growing up, my dad used to make us “pancakes” on the weekends. When I went to IHOP for the first time, I was shocked and appalled because they’re pancakes were so fat and dry. And you couldn’t roll them up with fruit inside. It took some time to realize what I had always known as pancakes were actually crepes. 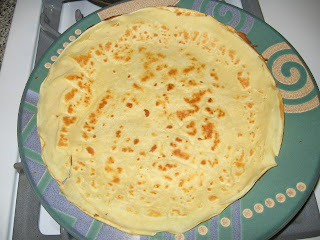 My sister and dad are the experts on these amazing crepes, but I’m learning as well. Here is our family recipe adapted from the 21st printing of the Joy of Cooking from 1980 (the recipe is different in my new Joy). We always double the recipe, but doing the math is part of the fun so I left the original amounts below…you can double it yourself. 3. Mix together liquid ingredients ad eggs. 4. Pour liquid into sifted ingredients and wisk gently (don’t worry if there are some clumps). 5. Heat skillet (the size you want you crepes). 6. Grease skillet (we use pam but oil is good too…this needs to be done before each crepe is put on the skillet). 7. Use 1/3 cup measure to scoop batter into skillet. 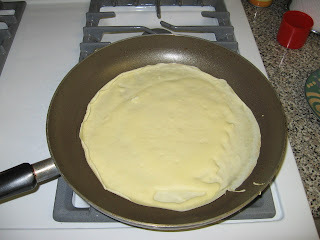 When adding the batter, tip the skillet to spread the batter evenly over the bottom of the entire skillet. 8. Cook on medium heat. 9. 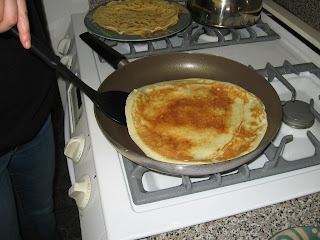 When first side is brown, flip crepe and brown the other size. We like them pretty light, and my sister and dad are the masters of the flipping skills! 10. 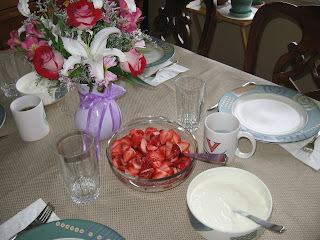 After all the batter is used up, serve with vanilla yogurt, cut strawberries, other berries, and/or nuts. 11. To prep the perfect crepe, place the crepe on your plate, spread yogurt on the whole thing and then add a fruit topping in the middle. Roll up the crepe and enjoy! I hope you can get as much pleasure out of this recipe as my family.